Wash chicken and pat dry with paper towel. Cut each breast into 6 chunks of equal size. (About 18 chunks total.) In a small bowl, combine flour and seasoning. Dip each chicken chunk into flour until well coated on all sides. Set aside. In a large non-stick skillet, heat olive oil over high heat. Add diced onion and sauté until translucent but not browned. Add coated chicken and brown first side. Using tongs, turn chicken and brown on second side. Add soup and reduce heat. Simmer, uncovered, for 30 minutes until soup is thickened a bit and chicken is done throughout. Serve over hot rice. If additional heat is desired, sprinkle lightly with Cajun seasoning (but taste first!). This one-skillet meal is perfect for Game Day. It's easy, spicy, husky and yummy all in one. In parts of the south, fricassee is considered dern good tailgatin' food. Made over an open fire with a big cast-iron bowl, it's served up "slop-style" and enjoyed by ridiculously giddy fans before big football games. Up here in the North, I make this Easy Fricassee recipe to fill up home-bound woolly mammoths on a cold Northern eve or -- better yet -- during the Super Bowl so I don't have to miss a play. You can totally keep one eye on the flat screen, the other on the stove. Now you'll look like one of the wild wolves up here. Fricassee is a way of cooking poultry or other meat by stewing it in some sort of gravy. At least that's De Official Def. But, since I'm more of a Nanook of the North than a belle of the South, I don't know a whole lotta 'bout real fricassee. So my version's a bit irreverent. Seasoned flour, chunked chicken breasts, canned Progresso soup, and diced onion. If you don't call that easy, you'd better be on the phone with Pizza Hut. Saute onion in olive oil just until translucent. Dip chicken chunks in flour that's punched up with Cajun seasoning. Place chicken in the pan and brown on the first side. Then turn with tongs to brown on the other side. Add yumlicious Progresso Tomato Basil soup. OMG. This smells amazing. Simmer uncovered for 30 minutes until soup is thickened a bit and chicken is done. Heat up some microwave rice (not kidding!) 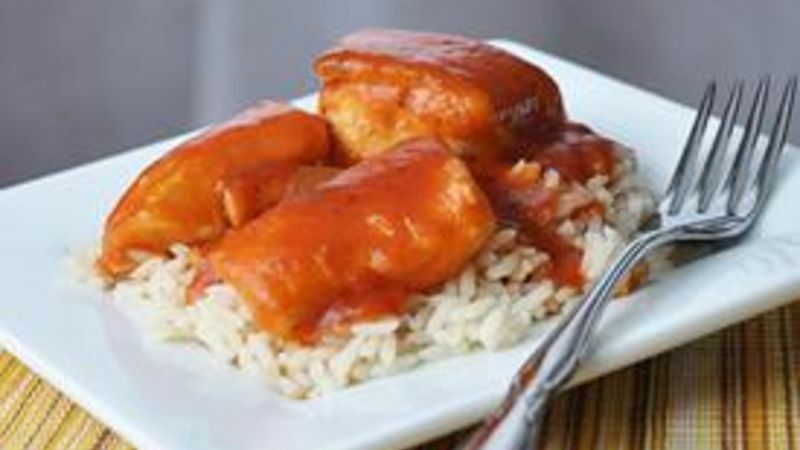 and serve the chicken and tomato "gravy" over the rice. Serve it in a bowl if keeping food on a plate while watching football is just too much to ask. Fricassee is frickin' forgivin' so add whatever else you want if it'll make your life more interesting and your fans more filled. It's your meal, so own it!